Guests paying top dollar for luxury accommodations will appreciate clear, sharp TVs nestled unobtrusively in the most convenient spots, ready to broadcast the morning headlines or late night sports events. 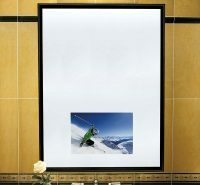 ToteVision offers the perfect small, commercial grade LCD televisions for hotel bathrooms and kitchenettes. Dazzle your guests with the clearest, sharpest, brightest picture available.